By viewing this website or anything made available on or through this website, including but not limited to recipes, product reviews and recommendations, Slay the Gym in 60 Days, Suggested workouts, exercises, emails sent by Megan Seelinger Fitness/ The Mermaid with Muscles, Information provided on all social media platforms and Private Facebook Groups etc. (collectively referred to as “Website”), you are agreeing to accept all parts of this Disclaimer. Thus, if you do not agree to the Disclaimer below, STOP now, and do not access or use this Website. This website is operated by Megan Seelinger, Megan Seelinger Fitness/ The Mermaid with Muscles. Throughout the site, the terms “we”, “us” and “our” refer to Megan Seelinger Fitness/ The Mermaid with Muscles. Megan Seelinger Fitness/ The Mermaid with Muscles offers this website, including all information, tools and services available from this site to you, the user, conditioned upon your acceptance of all terms, conditions, policies and notices stated here. The content on this Website and any information (including but not Limited to: newsletters, social media, images, emails, online chats, and telephone calls, herein referred to as 'information') provided by Megan Seelinger Fitness. is provided for informational purposes only, and is not intended to be a substitute for professional medical advice. None of the contents of this Website or any information provided are intended to be relied upon for medical advice, treatment or diagnosis. Any opinions expressed on this Website or any information provided are solely the opinions of the authors. Megan Seelinger, their affiliated companies nor any of their employees assumes any liability for the contents of any materials provided on the Website or any information provided Reliance upon any opinion or advice provided on the Website, via telephone, online chat. or emails at Your own risk. Megan Seelinger Fitness/ The Mermaid With Muscles makes every attempt to provide accurate nutrition and ingredient information for every produc. We take food safety very seriously: however, there is always a risk of cross-contamination. There is also a possibility that manufacturers of the commercial foods We use could change the formulation at any time, without notice. Customers concerned with food allergies need to be aware of these risks and understand that the consumption of foods provided by MeganSeelinger.com is at their own risk. The Trainer will use his/her skills and knowledge to design a program of exercise, but as a group training program Megan Seelinger Fitness is unable to take into account your lifestyle, personal goals, fitness level, and medical history. The Trainer will provide coaching, advice and support to assist you in achieving your goals. However, Megan Seelinger Fitness is not responsible for injuries or health conditions that result from following any of the suggested workout programs, now and on-going. You understand that the results of any fitness program cannot be guaranteed and that Your progress depends on Your individual effort. Accordingly, individual results may vary. In no case shall Megan Seelinger Fitness/ The Mermaid with Muscles, our directors, officers, employees, affiliates, agents, contractors, interns, suppliers, service providers or licensors be liable for any injury, loss, claim, or any direct, indirect, incidental, punitive, special, or consequential damages of any kind, including, without limitation lost profits, lost revenue, lost savings, loss of data, replacement costs, or any similar damages, whether based in contract, tort (including negligence), strict liability or otherwise, arising from your use of any of the service or any products procured using the service, or for any other claim related in any way to your use of the service or any product, including, but not limited to, any errors or omissions in any content, or any loss or damage of any kind incurred as a result of the use of the service or any content (or product) posted, transmitted, or otherwise made available via the service, even if advised of their possibility. Because some states or jurisdictions do not allow the exclusion or the limitation of liability for consequential or incidental damages, in such states or jurisdictions, our liability shall be limited to the maximum extent permitted by law. You agree to indemnify, defend and hold harmless Megan Seelinger Fitness/ The Mermaid with Muscles and our parent, subsidiaries, affiliates, partners, officers, directors, agents, contractors, licensors, service providers, subcontractors, suppliers, interns and employees, harmless from any claim or demand, including reasonable attorneys’ fees, made by any third-party due to or arising out of your breach of these Terms of Service or the documents they incorporate by reference, or your violation of any law or the rights of a third-party. These Terms of Service and any separate agreements whereby we provide you Services shall be governed by and construed in accordance with the laws of 1535 Ashland Ave, NORFOLK, VA, 23509, United States. 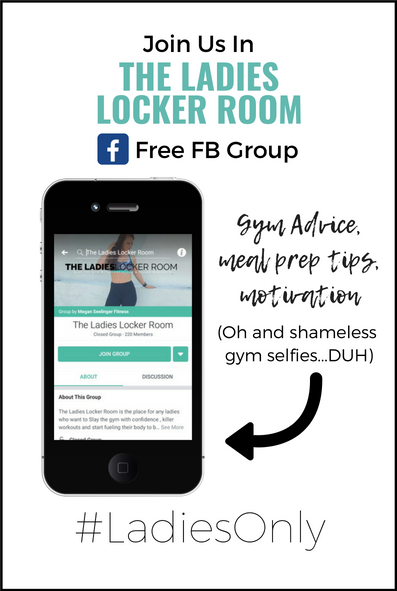 By continuing to use this website you consent for Megan Seelinger Fitness, @themermaidwithmuscles to use your photos, including, food and before and after pictures for advertising and marketing purposes. You understand and agree that these pictures will be public, posted on social media sites, and likely to be reposted. Questions about the Disclaimer or Terms of Service should be sent to us at meganseelinger@gmail.com.